Feb 01, 2016 50 Floor is very excited you are interested in purchasing new flooring and have considered having us to complete your installation. I apologize for any misunderstanding that has occurred during your meeting with our flooring specialist. 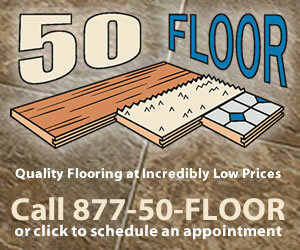 50 Floor is in the business of providing a quality product at great prices with excellent customer service. The encounter you have outlined in the review is not consistent with the experience of the thousands of customers we have been able to successfully install. I welcome you to contact the corporate office so 50 Floor may work toward resolving the skepticism you have detailed. i had a sales rep for 50 Floor out to my home today. They base their prices on an algorithm and not a per sq ft pricing. Their price was 262.5% more than the local flooring stores for just the material since they advertise there is no installation charge. What?? When questioned the salesman called his boss who lowered the price $10,000.00 without any hesitation to lock in the deal. I asked the salesman to leave and he told me that most people he deals with are not educated enough to realize they are being suckered into a lie. What is the deal??? Run as fast as you can from this fraudulent company. Reason of review: False advertising and inflated pricing. Review #777605 is a subjective opinion of User777605.